December 2013 – Dwonna Know What I Think? I won’t call you Phil, like everyone else does, because I do not know you personally. This is in the same way that you do not know me personally; however, that did not stop you from making a blanket statement about me and those like me. I’m talking about gays, not terrorists (just one group to which you equated us). My name is Blake Haney. I was born and raised in Tennessee. I’m not just someone shouting about what you said just because I read about it on Facebook. I am someone who used to watch your show, though I have not watched it since the dispute with A&E over how much money to pay you and your family. I bought family members Duck Dynasty merchandise even after I stopped watching, but that ends today. Growing up, I enjoyed hunting with my dad. I wasn’t avid. I wasn’t good at it either. I just enjoyed spending time with my father on the water. Waders, camo, guns…duck calls. I own one duck call. It was my dad’s, and I have held on to it for years. He even checks in every now and again to make sure I still have it. Sometimes, I’ll pull it out of the box, and I’ll call just to hear the sound. It’s a classic Duck Commander call. Funny how you were part of my life at an early age, and I never even knew. Today, I am at a different place in my life. After years of battling, I’ve finally accepted myself for whom God made me to be—gay. I have found a church that is accepting and loving, and I have accepted a calling to help young LGBT people find their place within the church. God loves them just as much as He loves you. You had an opportunity to use your platform for greater good. Instead, you singled out a group that fights tooth and nail just to have what you talk so much about on your show: family. Comments such as yours bring young people to their knees. They’re praying without seeing change. They’re trying, and they are failing. Instead of going on, they are choosing to end it. To say that I didn’t consider using the shotgun I had used to hunt with my father to end my own life would be a lie. Thankfully, I was able to push forward. Your words have meaning, sir, and you must take accountability for them. I don’t care from what generation you are a product. You are old enough to know better. As one of my former professors used to tell me, “Blame your parents for the way you are. Blame yourself for the way you’ve stayed.” It’s okay to have an opinion, but make sure it’s an educated one. Critically read your Bible. Befriend an openly gay person, and ask questions. Grow. My pet just died, so what do I do? Last week, I had to put my 10-year-old cat to sleep after the vet and I did everything we could to save her, and I grieve so deeply for her. She was my friend and my companion, and my apartment feels so empty without her. Yesterday, I went on the humane society’s website and saw a very cute kitten that I would like to adopt. My heart says he and I both need love. What do I do? First, let me say just how sorry I am for your loss. I am an animal person, and now that two of my dogs are more than 10 years old, I worry about the day when I might have to make that decision for them. When I had to put my 12-year-old black lab Langston Hughes to sleep five years ago, I told my mom that if I did not have three other dogs that I would probably never get another dog. The pain was so great, and I deeply missed Langston. He was best friend who had helped get me through my PhD program at the University of Texas at Austin. I have a friend who believes that our pets do not leave us until they know that we will be ok without them, and I’ve often thought this about Langston Hughes. He loved me even before I was in therapy, and he was with me when I moved to Clarksville and then to Nashville. When he died, I think he knew that I could get along without him especially since I had three other dogs at home to help take care of me. I’m certain your cat knows this about you, too. Some people think that they should wait before they get another pet because they believe that they are being disloyal to their pet if they replace him too soon, or they think that they should fully grieve their lost pet before they bring another one into their lives. I would like to think that our pets want us to continue loving and that they don’t see a new pet as a replacement but rather a continuation of the love we had for them. We all have a reservation at some cemetery (or mausoleum or crematory) without benefit of cancelation, and before we die, we should love as many animals and as many people as we can. I imagine that you have a lot of love to give a new kitten, and adopting that kitten today will open up space for an animal tomorrow who might have otherwise been euthanized. I’m going to end this with something I saw on Facebook this weekend, and although it was written about dogs, it can apply to the all animals we love. It’s never too soon to bring another cat into your home and into your life. Why miss an opportunity to love and be loved? 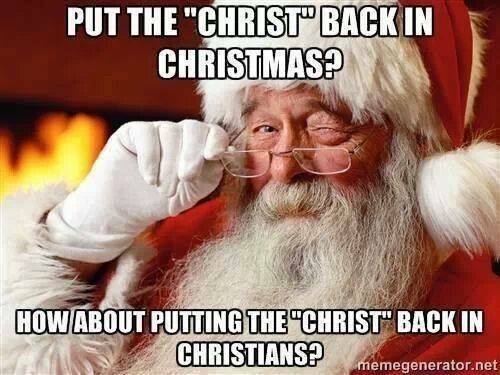 What do you think about those people who insist that there is a “War on Christmas” and that we should be saying “Merry CHRISTmas” and not “Happy Holidays”? I recently got into a Facebook “spat” with a woman I went to elementary school with over this very issue, and a former student accused me of condemning all Christians for the meme that appears at the bottom of this answer. After posting an article allegedly by Ben Stein that lambasted President Obama’s for changing the name of the White House Christmas tree to the White House Holiday Tree, I posted a link from Snopes.com that explained that Ben Stein never wrote this article and that this hoopla over the name change was kind of made up. My grade school friend then told me it was only because of “political correctness” that people were saying “Happy holidays.” “It should be Merry CHRISTmas,” she wrote. Yes, there are toy drives and canned food drives and angel trees to help the needy during this holiday season, yet for many, the Christmas season is now a commodity—a time to give friends and family gifts we probably cannot afford and that they won’t even remember they have in two weeks. Thus, it is a bit disingenuous to argue about whether we say “Merry Christmas” or “Happy Holidays.” If we really want to continue this “War on Christmas,” then we should focus not on whether we say “Merry Christmas” or “Happy Holidays” to each other but on how we treat each other each and every day of the year. The Christmas/holiday season should be about kindness, charity, love, and good will towards one another and not about what we call it. I’m coming out, I think…. I want to come out to my family, but I am scared. I’ve already come out to a few friends, but my family is so important to me. I just want to feel supported. How should I come out? Dwonna loves to send me the LGBTQI questions, and I love answering them. This question is one that many people have been asked me many times. It’s an enormous step, coming out as the person you’ve always been. Part of coming out is explaining that very fact to the people who love and care about you. You are still the person they’ve always known and loved. There is not one way to come out. I know people who have had sit-down, face-to-face discussions with their families. I know people who have made videos. I know people who have blurted it out at the dinner table because they couldn’t take the tension and the anxiety any more. I had already tried coming out when I was 17, and I allowed my parents to believe that my attraction to men was a phase that I could pray my way out of. In 2009, I came out to my middle sister, and three years later I came out to my oldest one, just a few months before my parents. My friends were getting married and having children, and I knew my family was waiting for me. However, I was waiting on something different, but really, it was something very much the same. It was just with someone of the same gender. So, after years of trying to make it work with the “right girl,” I chose to write my parents a letter. I did this mainly because I knew I would cry, and I wanted to be clear and precise. At 25, though, it was time. I was preparing to move from the comforts of Austin Peay and Clarksville back to my parents’ home in Chattanooga, and I wanted to return to them and to the city as a free person. I wrote my truth, stuck a stamp on the envelope, and sent it into the unknown. I knew that my parents loved me. In fact, I had always known that, but they raised their family in an independent Baptist church, and I was worried that they’d support the church’s beliefs over me. It was a Monday afternoon when my parents received that letter. My heart almost exploded when I saw a text from my mom. She responded positively, but in her usual brevity that I have come to love: “Got your letter. I love you. Good night.” Dad was the one I was most nervous to hear from. His text came on Tuesday; it was a beautiful response: “You are my son. My love for you is deeper than any ocean. I will call you later.” I will never forget their kindness and gentleness for accepting me for whom I am. I want to be clear, though. Not everyone is as lucky as I was. Some people experience pain and heartbreak as a result of coming out. I want you to remember that we, as a community, are here for you, and we sometimes have to become a family all our own. However, we also have allies who are there for us, too, and don’t forget to lean on those friends who you have already told. You’ll remember the moment you came out to your family for the rest of your life, and you will feel free just like I did no matter how it turns out.